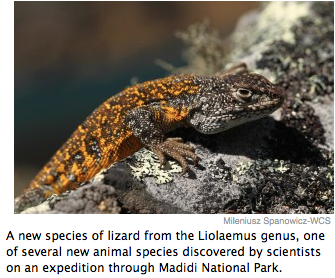 Scientists have discovered seven new animal species in Bolivia’s Madidi National Park. The finds, which include three frogs, three lizards and one catfish, were made last year and have now been confirmed as new to science. Experts made careful comparison with known species, according to the Wildlife Conservation Society and its local partners. The discoveries were made as part of the Identidad Madidi project to find unknown species in the national park. 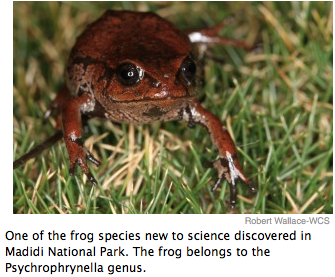 The new animal species include two new frogs from the same genus (Psychrophrynella) and a new high-altitude lizard. In addition to the new animal species, 10 plant species are under investigation as potentially new species. “New species for science are of course wonderfully exciting for the team, but Identidad Madidi is as much about connecting Bolivians and others to this natural wonder as it is about gathering knowledge about biodiversity in this record-breaking park and increasing the number of confirmed species for Madidi,” said expedition leader Rob Wallace of WCS. The 26-month Identidad Madidi expedition officially kicked off on June 5, 2015 and will eventually visit 15 sites. 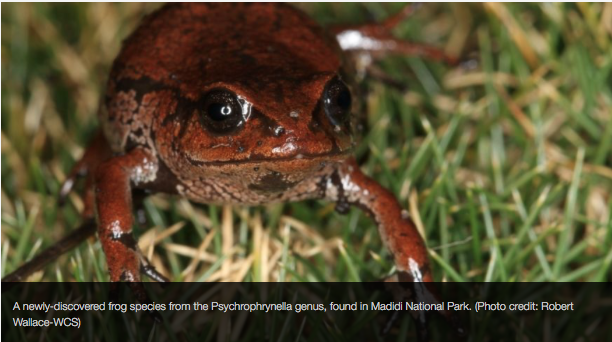 In 2015, researchers announced a new species of robber frog from the Oreobates genus, which was discovered during the first months of the expedition. Newswise — NEW YORK (April 28, 2016) – Scientists on an expedition through Madidi National Park—the world’s most biologically diverse protected area— have now discovered seven animal species new to science, finds that were made in 2015 and recently confirmed through careful comparisons with known species, according to the WCS (Wildlife Conservation Society) and local partners. In total, Bolivian scientists have discovered three frogs, one lizard, and three catfish that are new species to science, with ten plant species under investigation as potentially new species. The new species are the latest in a string of discoveries made by researchers with Identidad Madidi, a multi-institutional effort to find and describe unknown species and to showcase the natural wonders of Bolivia at home and abroad. The most recent discoveries include two new frogs from the same genus (Psychrophrynella) in the Andean valleys of Madidi and a new high-altitude lizard, according to James Aparicio and Mauricio Ocampo, two herpetologists from the Bolivian Faunal Collection and the National Natural History Museum. Last year, researchers announced the discovery of a new species of robber frog from the Oreobates genus, a find made during the first months of the expedition. 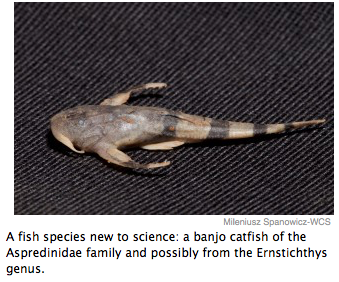 Meanwhile, Identidad Madidi ichthyologists have discovered two new species of three-barbled Cetopsorhamdia catfish (one previously announced) and a new species of banjo catfish from the Aspredinidae family (and possibly from the Ernstichthys genus) from the two lower sites sampled in 2015, the Tuichi River in the montane dry forests of Apolo, and the Madidi River itself at the stunning Alto Madidi rainforest location. According to Jaime Sarmiento and Soraya Barrera of the National Museum of Natural History, both of the three-barbled catfish have significant differences to previously known species in a series of key measurements. In addition to the animal discoveries, the research team may have found as many as ten new plant species during the expedition efforts during 2015. It will take a while to confirm these new species candidates that come from a number of diverse families and genera, ranging from Puya bromeliads, Aulonemia bamboo, Aa orchids, Hippeastrum flowers, Piper vines, and Chrysophyllum, Persea, Pourouma, Pouteria and Tachigali trees. Identidad Madidi officially began on June 5th, 2015 and will eventually visit 15 sites over a period of 26 months as the team of Bolivian scientists works to expand existing knowledge on Madidi’s birds, mammals, reptiles, amphibians, and fish along an altitudinal pathway descending more than 5,000 meters (more than 16,000 feet), from the mountains of the high Andes into the tropical Amazonian forests and grasslands of northern Bolivia. The next leg of the expedition will explore the stunningly picturesque Andean foothill forests of the Hondo River in April 2016, before moving on to the mysterious and logistically challenging cloud forests farther up the Andes in June and July. In late August the team will make a 6-week visit to the lowland tropical natural grasslands and true Amazonian forest along the Heath River. The expedition can be followed online at http://www.Facebook/IdentidadMadidi or http://www.identidadmadidi.org, #IDMadidi. Participating institutions in Identidad Madidi include the Ministry of the Environment and Water, through the General Directorate for Biodiversity and Protected Areas, the Bolivian National Park Service and Madidi National Park, the Ministry of Education through the Vice Ministry of Science and Technology and the Bolivian Biodiversity Network, WCS, the Institute of Ecology, Bolivian National Herbarium, Bolivian Faunal Collection, the National Natural History Museum, the Alcide d’Orbigny Natural History Museum and Armonia with funding from the Gordon and Betty Moore Foundation and WCS. MISSION: WCS saves wildlife and wild places worldwide through science, conservation action, education, and inspiring people to value nature. VISION: WCS envisions a world where wildlife thrives in healthy lands and seas, valued by societies that embrace and benefit from the diversity and integrity of life on earth. To achieve our mission, WCS, based at the Bronx Zoo, harnesses the power of its Global Conservation Program in more than 60 nations and in all the world’s oceans and its five wildlife parks in New York City, visited by 4 million people annually. WCS combines its expertise in the field, zoos, and aquarium to achieve its conservation mission. Visit: http://www.wcs.org ; http://http://www.facebook.com/TheWCS; http://www.youtube.com/user/WCSMedia Follow: @thewcs. This entry was posted in Beni, Bolivia, Environment, La Paz, Tourism and tagged biodiversity, environmental awareness, Madidi Park, National Parks, WCS. Bookmark the permalink.